==> Speaking of the cruise, this is the episode Tom and I recorded in front of the live audience. Good stuff–and don’t miss the Easter egg at the end. ==> Not sure how I stumbled on this, but an old Mises blog post reminds us that Bill Kristol has been wrong about everything. ==> This is hilarious: It’s my own take on William Nordaus, except in a Bizarro universe where I favor aggressive government intervention to arrest climate change. ==> I was part of a panel that nominated the Best Economics Books for beginners. There’s no trend in tropical storm activity. There is a lot of variation from year to year and sometime you get arond 5 years of low activity (such as 2009-2014) but the bigger picture trend is neither up nor down in the 40 years of available data. The most important chart is Global and Northern Hemisphere Accumulated Cyclone Energy, which he measures in knots squared (a horrible unit but probably makes sense to Meteorologists), I’m guessing he does not attempt to calculate variations in the water content of the storm because it’s too difficult, you can presume that averages out. That year, 1992, scientists studying ice cores taken from the Greenland Ice Sheet, confirmed that, in the past, climate had undergone huge swings in as little as a few years. This is a total crock. The ice cores are not precise enough to measure down to a few years, and the “Younger Dryas” has been known about from a variety of sources starting from early 20th Century. There’s various sources shown there and yes the warming phase at the end of the Younger Dryas was a sudden warming period, but best estimate is that is was around 100 years, but slower in some places on Earth. We already know there’s a big variation between one year and another year in any given region, so the very concept of climate changing within a few years is ridiculous. At any rate, this warming was perfectly natural, so we can forget about the idea that natural warming is somehow impossible, meaning that we don’t know how much of the recent warming is also natural. In addition even though the changes during the Younger Dryas were quite drastic, humans adapted, and furthermore the warmer climate is less harsh for human habitation. The author is simply fear mongering, in a most uninhibited way. An honest question, do you actually think anybody has that idea? There is plenty of other evidence — the pattern of warming, for example, which is greatest in the Arctic, and the pace, which is faster (as best we can tell) than prehistoric warming episodes. The upper atmosphere has actually cooled, because so much heat has been trapped below. The bottom line is that nobody has come up with a natural explanation for the current warming episode that fits the observations. At the same time, the un-natural explanation—that our industrial civilization is a big part of the cause—fits the evidence. Since the warming at the end of the Younger Dryas was greatest in the Arctic and more rapid than anything else humans have experienced, that rules out most of his evidence. There’s no way to compare stratospheric cooling with any fossil record so that’s not really proof of anything… quite possibly the stratosphere has in the past shown natural variations too. As for the “I have no other explanation” argument, well it’s hardly like every single natural historical event has a solid explanation either, but the climatologists should start by explaining why the Holocene has been more stable than the previous glacial / interglacial cycles, before using the argument from ignorance. No, do you think anyone believes natural warming is impossible, as you implied? It is obviously a very, very different question whether this warming is natural. The guy you quote obviously believes natural warming is possible. Despite all these lines of evidence, many known climatic cycles are often trumpeted to be the real cause, on the Internet and in the media. Many of these cycles have been debunked on Skeptical Science, and all of them either aren’t in the warming phases, don’t fit the fingerprints, or both. For example, we are warming far too fast to be coming out of the last ice age, and the Milankovitch cycles that drive glaciation show that we should be, in fact, very slowly going into a new ice age (but anthropogenic warming is virtually certain to offset that influence). The “1500-year cycle” that S. Fred Singer attributes warming to is, in fact, a change in distribution of thermal energy between the poles, not a net increase in global temperature, which is what we observe now. Again, the end of the Younger Dryas proves that rapid warming can and did happen at the end of the last ice age (presumably he means shift from glaciation to interglacial, since strictly speaking the Pleistocene Epoch is all ice age, but that’s fiddly semantics, I’m not going to criticize at the nitpick level). Cooling from the Milankovitch cycles could be as much as 10C based on Vostok ice cores but it takes thousands of years to go into a cooling cycle so I’m not personally worried about it. Seems kind of ridiculous to think that the tiny effect of CO2 will offset such a big cooling, but that’s a prediction, not really relevant to the question of comparing natural causes with human produced causes. Then there’s the question of the flip/flop energy distribution between North and South, and I’ll point out that while Arctic sea ice has been melting, the Antarctic sea ice has been growing (not in exact proportion). Since the North is where most of the people are (and most of the thermometers) and historically the North seems more sensitive to climate change, the cyclic idea does at least partly fit what’s happening here. The first step should be explaining why the Holocene is so stable from a temperature perspective, because that’s not normal on Earth. No. Again he confirms a belief in natural warming, the complete opposite of what you are attempting to show. The LA Times link doesn’t work in Europe. Of course it is because of the GDPR legislation but that has been in place for 6 months now and all the other American websites have dealt with it since day 1. Not that I particularly miss it and if I did I could work around it with a VPN (just like I do when I want to watch American – only Netflix) but I wonder why they don’t care enough to bring their first-class journalism to Europe. He’s a Demokkkrat that “identifies” as a Republican. 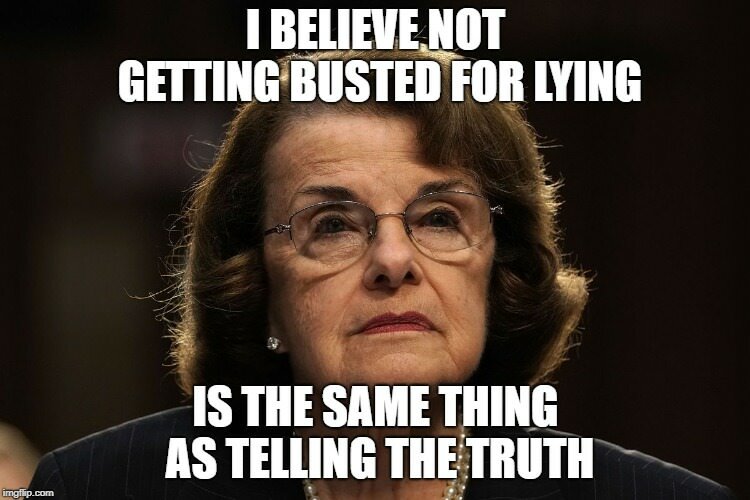 When the standard of truth is “what you can get away with”, the result is having to witness Senators try to destroy an innocent man’s life by lying about his history with women. Those glory days, when there was some accountability, with consequences for getting caught out in a lie. It is an appalling standard for truth, to be sure, but so much better than the one we have now.